Faro’s latest ultra-portable focusslaser scanner enable to capture fast, straightforward and accurate measurements of complex objects and buildings. The intuitive touch-screen of the focussmodels has been increased in size and clarity to deliver an extraordinary user experience. A built-in 8 mega-pixel, hdr-camera captures detailed imagery easily while providing a natural color overlay to the scan data in extreme lighting conditions. Familiar traits such as light weight, small size and a 4. 5-hour battery run time per charge makes the focusslaser scanner truly mobile for fast, secure and reliable scanning. 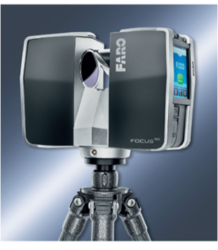 Within the Laser Scanner Focus Series, FARO offers its customers the possibility to choose between short, mid and long range laser scanners with the latest technology and high accuracy. With the sealed design, the Focus devices are certified with the industry standard Ingress Protection (IP) Rating and classified in class 54 against environmental influences. In addition scanning in challenging temperature conditions is possible due to an extensive temperature range. With the on-site compensation functionality users can verify and adjust the Focus compensation on-site or in the office, ensuring the highest scan data quality. A comprehensive compensation document is automatically generated. Weighting only about 4.2 kg the Focus Laser Scanner is a truly mobile and portable.